Our “Checkertail” T-6 Texan Warbird is available to sell rides to your event attendees, and/or for static display on your ramp. The distinctive Checkertail stands out on the ramp and in the air. The roar of the 600 HP Pratt & Whitney radial turns heads when it fires up. 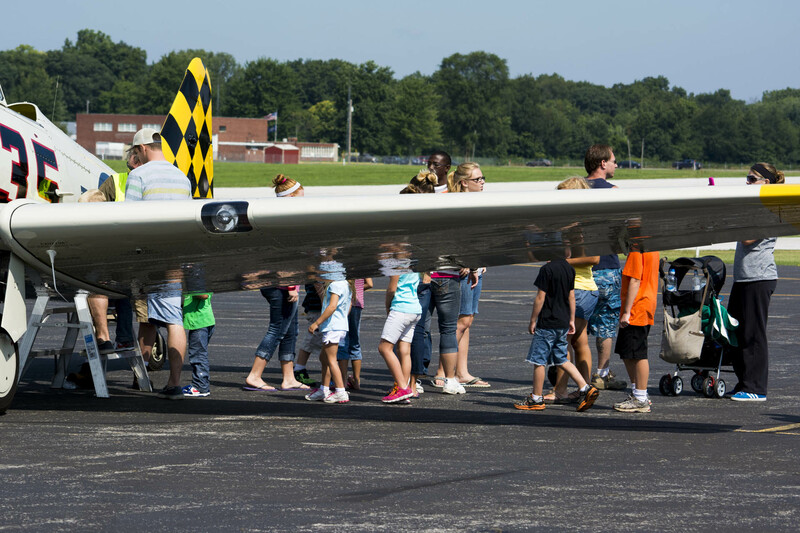 The airplane generates excitement and interest both in and at your event. We have over 6 years experience with attending events, interacting with event attendees and providing them with an exciting nostalgic aviation experience. Our dedicated and professional pilots and ground crew work closely with event organizers, ensuring that we work well within the parameters of your event and its operational needs. In 2009, the Checkertail T-6 made its airshow debut at the Indianapolis Air Show. It appeared in the Warbird Review section of the show and was displayed statically on the Warbird ramp. It also appeared on static display at Airventure and won the “Best Preservation” award in competition judging. … and a host of fly-ins in Indiana, Ohio, Michigan, Illinois and Kentucky. To inquire about scheduling us at your event, please email us at: info@warbirdtc.com. We’ll be happy to discuss your requirements and look forward to hearing from you!